but not on a jet plane. Tomorrow morning we leave for our first official 'family' vacation. We are going to Omaha - the main attraction on our list being the zoo, but several other places are on the agenda also. After a couple crazy busy, and somewhat stressful, weeks at work, I can't wait to get away for a bit and have some fun. Have a great Labor Day weekend and I'm sure I'll have lots of pics to share when I get back. 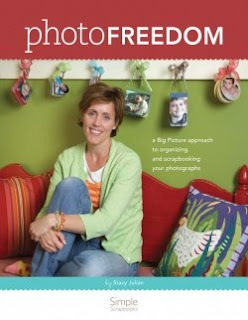 The title of Stacy Julian's new book, Photo Freedom , has a double meaning for me. A lot has changed since I began using a digital camera. Most importantly, my photo taking abilities have improved greatly simply because I have more freedom to experiment without any direct costs (i.e. film, developing) involved. Through this experimentation (i.e. practice), anyone's photography skills are bound to get better. Secondly, I take and keep a lot more pictures than I ever would have dreamed of when using a film camera. Therefore, I've found myself at time feeling anything but free when dealing will all the pictures in my camera and on my computer. Stacey's book is a guide into not only bringing those feelings of being overwhelmed by photos into control, but also in finding more effective ways of helping those photos find their way into our scrapbooks and memory art. "Scrapbooking actually describes the ongoing multi-dimensional spectrum of activities that begins with an awareness of your life, followed by a desire to photograph and record your day-to-day experiences, ultimately resulting in scrapbook albums that are overflowing with colorful, perspective-laden layouts, each of which contributes in some small way to the story of you life and heritage." Now try to say that all in one breath! However, it really does sum up the way that I have come to view scrapbooking. There's no mystery in Chapter 1. Stacey basically outlines her processes for organization. She talks about three essential storage items - storage binders, category drawers, and library albums - and how they are utilized for efficient scrapbooking. Stacy also discusses several 'extras' that work for her. My favorite of these was a 'School of Life' file box for collecting artwork and schoolwork each year of your child's career. I implemented this 'extra' before I even finished the book and love it. It solved a storage issue I'd been struggling with for quite some time. Here, Stacey shares a 6 step proess for organizing your photos, both prints and digital files. Also included within this chapter are 11 case studies that highlight pages and projects along with detailed information about how they evolved from her system. In other words, Stacey was sure to collect a vast cross-section of the scrapbooking community to show that her system (or some variation of her system - see below) can work for anyone. The other thing I loved about this book is that Stacey acnologes that not every piece of the system will work for every person. "...remember that the all-or-nothing rule doesn't apply to this bok or my system. You might be ready to embrace it all - or maybe you'll only find relevance in parts and pieces of what I share." I found myself to be in the second group, but regardless of the fact that I chose not to adopt every aspect of her system does not change the fact that the ones I did adopt have forever changed the way I organize my photos and get them scrapped. ??? I am always curious and open to hearing the opinions of others. If you own or have read this book, please feel free to share your opinion of it in the comments below. Visit the Photo Freedom page at Amazon.com. You can also read more of my reviews for other recommendations. I've got several sets of scrapbooking/craft magazines on sale now in my eBay store. All issues are from 2008, so check them out. If you win more than one auction from me, I'll charge you only $.99 shipping for each additional item after the item with the highest shipping. It's a great opportunity for a boxful of affordable inspiration. I also have a few sets of non-scrapbooking mags like Martha Stewart Living and Real Simple listed as well. I love those magazines! They have lots of great ideas for general household use, but they are also quite trendy and well-designed. There have been several times that I've actually gotten inspiration for my scrapbooking from them for things like interesting color combinations or layout design. Since my daughter is my main photo subject, I've come up with a few general rules for photographing kids over the years. I hope you find a few that will help you get the shot you're looking for. #1 - No cheese, please! Avoid simply telling a child to smile or using the overused “say cheese.” Generally, all you’ll get are fake, awkward grins. It’s much better to find other avenues for getting the expressions you’re looking for. Ask them about their favorite cartoon characters. Tell them a story or a silly knock-knock joke. And remember, smiles are not necessary at all sometimes. Some of my favorite shots of my daughter are ones in which she’s sporting a serious or thoughtful expression. Strive to capture various expressions. Even silly or unhappy faces can have a certain charm and can tell volumes about a child’s true personality. Case in point below...yes, she is a goofball! #2 - Let them take the lead. Kids have a ton of energy and trust me, you’ll sap every ounce of yours and then some, trying to get them to pose ‘just so’. It’s much easier to give very general directions like “Why don’t you go smell those purple flowers? I bet they smell like candy.” Then, just follow and snap away. Believe it or not, all I told my daughter in the photo below is that it looked like a great rock to climb on and she did the rest! They move fast, so you must also. I suggest leaving the tripod at home when shooting children. You’ll only because frustrated by toting around extra equipment and probably end up missing some great shots. In addition, it’s important to know your camera. Know what settings you plan to use for the shoot and have it set before it even gets started. Kids can quickly loose their interest in getting their picture taken and you don’t want to waste valuable time fiddling with camera settings. You may go into the shoot knowing what you want, but with children you often must take what you can get. Sometimes what they’ll give you if you let them do it naturally is better than what you had in mind anyway. I often joke about my 50:1 ratio, but it actually rings true for most photographers. It generally take a lot of shots (50) to get 1 great photo. That’s just the way it is no matter how good you are. Have you ever seen a professional photographer take five pictures and call it a day? I highly doubt it. #5 - Vary your distance and angle. Since children are generally shorter than the photographer, it is important to get down on their level to avoid distortions. However, that being said, it can also be fun and often lead to some very interesting results by shooting from various levels. So, get your eye-level photos, but then also shoot some from above and below as well. Shoot close-ups and full-length. Adding variety to your shots can ensure that you don’t miss any important details in their expressions, outfit or surroundings. The use of props can be a great idea when photographing children for several reasons. For one, it can sometimes help the child to focus their attention and give you a few extra moments to get that ‘perfect’ shot. They can also enhance the photo by telling a story. For example, using a pumpkin is a great photo for a fall photo shoot or a book would be a great way to show a child’s love of reading. Now, I know I just told you it can be a good idea to bring items into your photos, but don’t overdo it. One pumpkin can have the same thematic effect as five and often less is more. This can also sometimes translate to their outfit as well. You don’t want their outfit to be to busy or it can actually compete or clash with your subjects surroundings and take attention away from their face or the story you’re trying to tell. #8 - Focus on the eyes..usually. There is nothing quite like the eyes of a child. Therefore, you generally want to make sure that your focus in on them in most photos you shoot. However, there may be times when it makes sense to place the focus elsewhere such as when your subject is not looking at the camera or a prop is being used. Perhaps the prop is their favorite book and the book is important to the story you are trying to tell in the photograph. In this instance, you might actually want to bring the front of the book into focus while leaving the child reading the book in the background out of focus. #9 - Location is key. I am always on the lookout for new photo shoot locations. Even in my small community, there are tons of places that lend themselves to great backdrops for photos – a metal fire escape in a downtown alley, the uniquely carved front doors of a church, or beautiful flowering bushes in a local park. Making your photo subject to these places can also be fun for them because it gives them a new place to ‘explore’ while you capture the perfect shot. #10 - Keep it fun! Include the child in what you’re doing. If you are using a digital camera with an LCD screen, let them view some of the photos on the screen and give them compliments about how wonderful they look. You might even want to let them take a shot or two. By making it fun and making them feel special, they are likely to feel more comfortable and be more cooperative during the shoot. Today was Kaitlin's first day of Kindergarten. She was so excited and I can't wait to see what she'll learn this year. There were no tears for me this morning. Being that this is the third year of school for her, I've come to terms with my growing little girl when it comes to sending her off to school. She was so proud! It actually happened last Friday night as we were waiting for the Riverboat Days fireworks to start. She had been waiting SOOOO long to lose a tooth and said that the bigger kids were teasing her because it hadn't happened yet. No more teasing now. The Tooth Fairy was feeling pretty generous, too...a $10 plus odd change. (This was not my idea, by the way.) Either Kaitlin going to mighty disappointed with the Tooth Fairy (aka 'daddy') with future payments or her wallet is going to get mighty thin! One of the highlights of Riverboat Days this year (other than Kaitlin's activities), especially for Justin, was the jumps by the Golden Knights. They jumped on Friday night just before the fireworks and had fireworks shooting from their feet. It was pretty impressive, but I didn't get pictures. I decided to leave the camera home that night and just enjoy the show. This is the group going through the parade on Saturday morning. They jumped again on Saturday evening and it was pretty neat to get to see them do their stuff during daylight as well. Kaitlin's events on Saturday went well. She had a lot of fun in the parade and the Children's Theatre float received second place in their category. After the parade, Justin, Kaitlin and I spent quite a bit of time down at Riverside park looking through the craft booths and, of course, we had to take in a little Brule. At one of the booths, there was a man making pottery and Kaitlin thought it was pretty cool...she didn't want to stop watching him. It was pretty cool. We went home for a bit to get freshened up before Kaitlin's dance performance and got back down to the river just in time to watch the Golden Knights jump (pictures to come), but it made us just a little too late to get seats in the amphitheatre. The girls certainly performed to a full house! It was a good thing that Kaitlin's group was toward the end because it took that long before we were finally able to find a couple seats where we were actually able to see her dance. It was a long day, but it was some great family time...something we don't get enough of. So my sister's bridal shower went well today. It was certainly the end of a very busy weekend with Riverboat Days and all. I have some pictures to share from RBD once I have a chance to go through them. I honestly didn't really even get many pictures at the shower today. We were too busy getting everything together, but here is the guest book that I made for my sister, Lynn, to use for her bridal shower and wedding. It's Riverboat Days in Yankton this weekend and the festivities start tomorrow evening. We plan to head down to the river to take in the fireworks which I've heard is supposed to be the biggest show ever in Yankton. We'll see I guess. On Saturday morning, I'm helping with registration for the 5K Walk/Run hosted by Mount Marty and then as soon as I'm done with that, Kaitlin has to be to the float for the Children's Theatre to get ready for the big parade. We hope to take in the Arts in the Park and a little Brule in the afternoon and then Kaitlin has to be to the Ampitheatre by 6 p.m. to prepare to dance with her Academy of Dance class. They probably won't be on stage till 7:30 or so. Then, my sister Lynn's Bridal Shower is on Sunday, so this week has consisted of a lot of final preparations for that. My gift to her was that I made her guest book for the shower and wedding and I spent about three nights this week working on that, but I really like the way it turned out. I did take pictures and will be sharing those soon. It will be a busy weekend, but it also should be a fun one and hopefully I'll have a lot of great photos to show for it. It's not a layout this time, but just a picture in Simple Scrapbooks. This photo was featured in the September/October 2008 issue for their Focus on Photos column. You can find it on page 45. The premise of the article is how to get better Halloween photos. Stand off to the side. A few days before Halloween, Jill took her daughter Kaitlin to a local park for a costume photo shoot. The autumn leaves and stone archway provided a perfect setting for Kaitlin to make a witch's brew. Jill stood off to the side, shooting pictures while Kaitlin played. "Telling Kaitlin exactly what to do usually doesn't go well," says Jill, "so I just let her do her thing while I shot a lot of pictures." To see more photos from this particular shoot, go here. Had another busy weekend and managed to knock a few more things of the list of 'things to do'. We finished out the second weekend of our rummage. It wasn't quite as profitable as the first weekend, but we expected that. Still, we got rid of quite a bit more stuff and made a little more money doing it, so that's good. I am glad to be done with it for this year though...I am rummged out. I attended a family reunion yesterday afternoon and that was nice. Kaitlin and Justin had to stay behind because she had dance practice for her upcoming Riverboat Days performance this weekend with her Academy of Dance group. She is quite excited about that. I am looking forward to this weekend, but it sure is going to be another busy one with Riverboat Days and my sister's Bridal Shower on Sunday and I've got a lot to get done before then. It'll be here before I know it. This one was on page 54 of the Memory Makers Scrapbook Idea Gallery 2008 issue. A Soccer Star in the Making? Kaitlin played soccer for the first time this fall. So, we had to go out and get all the appropriate attire…the shorts, the shirt, the shin guards, the shoes and, of course, the ball. She was even more excited when she found out that her good friend, Jaden, was on the same team!! One of the first things they learned was the importance of stretching before going out on the field and Jaden is the little boy right next to her. Their coach, Andy Kohl, was really great with the kids…very patient and good at keeping it fun and exciting for them. The journaling is hidden on a tag behind the main photo. The white ribbon tab is inked to help it blend with the ‘dirty’ PP and fonts. 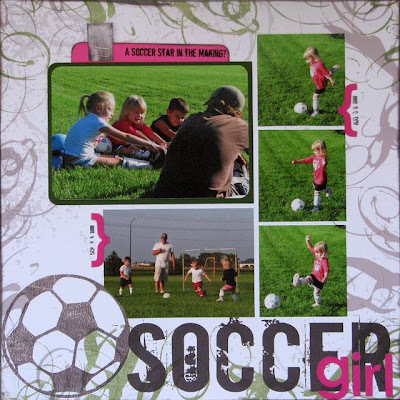 The pink journaling card, parenthesis accents and added title letter stickers coordinate with the subject’s pink shirt and further highlight that this page is about a girl athlete. I've gotten a couple more requests for layouts recently. That's always exciting news. One was from a Canadian magazine called Scrapbooking & Cards Today and this will be my first time being published by them. As usual, I can't share the layout until it comes out, but I can tell you that it will be in the fall issue and the layout is Halloween related. Can't wait to see it in print. The other request I just got last week and it is for the January/February 2009 issue of Memory Makers magazine. This will be the 8th layout that I've had published by them. They've been good to me! Thanks, MM!! The other thing that I loved about The Bucket List was this song! I can't get enough of it! We were scrabbling to get everything ready for our rummage this past weekend, but we made it. I took the afternoon off on Friday, so that I could get all the last minute stuff in line. My mom, brother & sister-in-law, and several friends all brought stuff over in addition to our own, so we had A LOT of stuff. The garage was full and we spilled out onto our driveway and half of our front lawn. We figure if you're going to do it, you might as well do it BIG! Since we knew we'd have a lot of outdoor set up to do, Justin actually put up caution tape around the perimeter of our driveway and yard this year so that we could actually get things in order before the early birds began to swoop in, but boy did they circle anyway. We listed 5 p.m. as our start time in the paper and people were already stopping by 3:15 p.m.!! By the time we were ready to open (a little before 5 p.m., I might add), there were people lined up all along the front side of the caution tape along our sidewalk! In general, I LOVE holding rummages. It's a great way to purge, make a little money while doing it and we always end up seeing people we haven't see for awhile. However, if I had to name one thing I DON'T like about rummages, it's the rude early birds. If they simply stop and ask what time we're opening, go on their way and come back later, that's not a problem...most people are very nice. It's the ones that hover impatiently and make rude comments like we're inconveniencing them in some grand way because we're not opening an hour and a half ahead of time just for them. UGH! I really meant to take pictures before we started, but it was all just so hectic and those few rude early birds had me so frazzled, I totally forgot. It honestly looked a little more like an auction than a rummage sale! We were open for about 9 hours total between Friday evening and Saturday morning/early afternoon and the final count was about $1,300. Not too shabby! We sold a lot of stuff...but there's still quite a bit left. It's the city-wide rummage this weekend, so hopefully it will bring some hard-core rummagers to town and we'll have another good run. We're praying for another weekend of good weather. Yesterday was Kaitlin's final theatre class and so they put on a performance for the parents. She was an elephant trainer, a strongman, and a dancer. The elephant trainer was actually my favorite act, but I didn't get that one on video. Here is her strongman act. I apologize for the low-quality video, but you'll get the idea. She's the one in the blue suit.